The Apple Store: Make an appointment online or by phone and then go to your local Apple Store if one is handy to find out what the folks there might know about your problem. 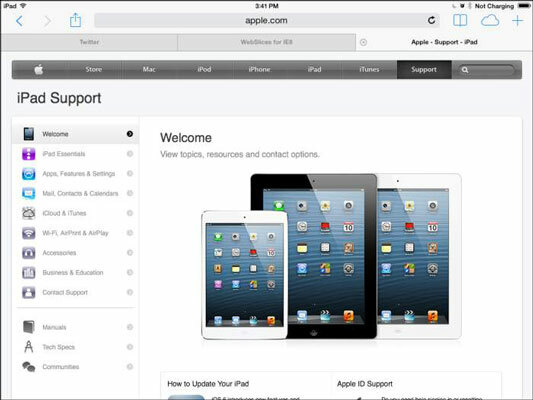 The Apple iPad Support website: See the figure. Here you find online manuals, discussion forums, downloads, and the Apple Expert feature, which enables you to contact a live support person by phone. Don’t forget to check out the manuals and discussions for help. The iPad User Guide: You can use the bookmarked manual in the Safari browser. This is a more robust version of the bookmarked User Guide. You can also download the manual and read it in most popular e-reader programs. The Apple battery replacement service: If you need repair or service for your battery, visit this site. Note that your warranty provides free battery replacement if the battery level dips below 50 percent and won’t go any higher during the first year you own it. If you purchase the AppleCare service agreement, this is extended to two years. Also note that Apple recommends that the iPad battery should be replaced only by an Apple Authorized Service Provider.